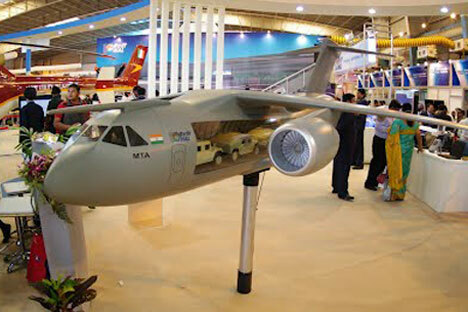 The contract on Il-214 also known as MTA has not been concluded with the Defence Ministry yet. The Russian-Indian joint project for the creation of a military transport plane has been frozen, CEO of the Ilyushin company Sergey Velmozhkin told reporters on Wednesday. "It has been frozen as a joint Russian-Indian project," the Ilyushin CEO said, commenting on the development of the plane that is also known as Il-214 and MTA. The contract on Il-214 has not been concluded with the Defence Ministry yet. "The preliminary design is practically ready. We’ll offer it, but the decision depends on the customer. Experts confirm that there is a demand indeed for such aircraft. We hope to clarify the issue somehow by the middle of the year," the CEO said. It was reported in early 2015 that Russia and India planned to agree in the third quarter of the year on the pre-contract documentation on the MTA program. The beginning of the main stage of the aircraft designing was planned for late 2015. According to documents, MTA is classified as a medium military transport airplane handling the transport of a broad range of cargo weighing 20 tons, for a distance of over two thousand kilometres with dirt or paved runways. The possibility of using the aircraft in high altitude (mountain) airports in different geographical or climatic conditions, day or night, in easy or adverse weather conditions is also being reviewed. As a military-transport aircraft, the MTA is designed to transport and para-drop personnel, cargoes, and technology on landing pads, and to drop off cargo without parachutes from low altitudes.